Another good bit from the Etymologicon [previously]. This time, why brackets are named after codpieces. 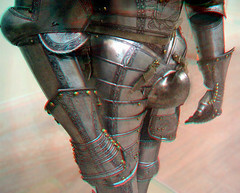 The ever-more-elaborate codpieces in medieval armour were called braguettes. What do you call the bit of stone that bulges out from a pillar to support a balcony or a roo? Until the sixteenth century nobody had been certain what to call them; but one day somebody must have been gazing at a cathedral wall and, in a moment of sudden clarity, realised that the architectural supports looked like nothing so much as Henry VIII’s groin. You are currently reading Brackets and codpieces at Dan O'Huiginn.